A daughter of Pohaniec, Anielka. She belonged to Wilkesbacka and is the mother of two breeding stallions, Arkusz and Azir (3/4 brothers actually). Anielka's dam *Areka was exported to Patterson Arabians where she had several good offspring by Negatraz. 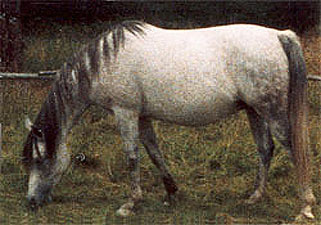 Anielka comes from the family of Sahara OA, a Kuhailan strain. Sahara was imported in 1845 along with Gazella OA and Mlecha OA to Jarczowce. The only direct line from Sahara OA is that from her daughter Sahara Slepka OA who was foaled in transit. Many members of this family perished in World War I and only two mares were saved, Pomponia 1902 and her daughter by Kohejlan OA, Zulejma 1914. After the war Pomponia had two more daughters, Dora 1922 by Bakszysz and Bona 1920 by Mazepa I. Of the postwar daughters, only Dora had any impact on the breed.